Installers need to be aware of building code requirements in the geographic areas where they are installing, and how the codes relate to the instructions given in this manual and by the siding manufacturer. The requirements of local building codes must always be observed, because they represent the legal requirements for an installation in a given jurisdiction. However, local codes are based on the national model building codes. Model codes themselves do not have the force of law until they are adopted by a state or local jurisdiction. In the United States, the primary source of model codes is the International Code Council, which publishes the International Building Code (IBC), International Residential Code (IRC), and International Energy Conservation Code (IECC). In Canada,the primary model code is the National Building Code (NBC), published by the National Research Council of Canada. Most of the model building codes, and thus the local codes based on them, recognize that the product manufacturer usually knows how its product should be installed in order to provide best performance. Therefore, most building codes reference the manufacturer’s instructions and state that the product must be installed according to the code and the manufacturer’s instructions. However, any specific requirement in a local code will usually override any provision of the manufacturer’s instructions, especially if the local requirement is more restrictive. Therefore, vinyl siding installations must always conform to local building codes, but the local code may also require that the installation conform to the siding manufacturer’s instructions. The codes provide the greatest recognition to products that have been certified to a recognized standard by an approved quality control agency. In fact, current editions of the IBC and IRC model codes require: vinyl siding to be certified to ASTM D3679; polypropylene siding be certified to ASTM D7254; insulated siding be certified to ASTM D7793; and all to be verified by an approved quality control agency. As relevant editions of the model codes are adopted by local jurisdictions, code officials will want to verify that the siding is properly certified and that the installation conforms to the manufacturer’s instructions. Always be sure that the instructions are available on the job site for an inspector to review. This manual is not a building code and it is not a substitute for the manufacturer’s instructions. However, it has been developed by referencing the provisions of the model building codes, the requirements of ASTM D4756, and generally accepted installation practices within the vinyl siding industry. This manual therefore reflects the most common installation requirements that apply to the vast majority of vinyl siding products. Use this manual to understand how vinyl siding and soffit should generally be installed, but be prepared to comply with any differing provisions of local codes and the manufacturer’s instructions for a specific product. Vinyl siding is remarkably resistant to high wind, given its light weight and relatively simple installation. But in order for it to perform to its potential, it must first be properly selected, and then properly installed. All certified vinyl siding is tested for wind load resistance and must meet certain minimum requirements. This testing results in a “standard wind load design pressure rating,” or the maximum wind pressure the siding is designed to withstand when it is installed using the standard methods described in this manual. Those involved in selecting or specifying vinyl siding need to know how to ensure that the siding is rated high enough for the location and the building, but that is beyond the scope of this manual. Vinyl siding installers need to make sure that the siding is installed in a way that allows it to meet its rating. The instructions in this manual provide the minimum requirements for most vinyl siding products for most installation situations. However, the manufacturer may have different instructions for their products, or may have special installation requirements that apply in high-wind locations. Always consult the manufacturer’s instructions before starting a vinyl siding installation. Proper starter strip: Always use the starter strip specified by the manufacturer. A starter strip that is not matched to the lock design of the siding may allow the bottom course of siding to blow off, which can lead to loss of the whole wall of siding. Connection to framing: Most vinyl siding must be fastened through the sheathing directly to the building framing or other structural component. That can be wood studs, furring strips, or directly to masonry. Fastener penetration depth: Follow the manufacturer’s instructions, but usually the fasteners need to penetrate a total of 1 1/4” (32mm) through wood or a material with equivalent holding power. Typically, that would be through 1/2” (12.7mm) of wood sheathing and 3/4” (19mm) into wood framing or furring. Proper fastener: In order to hold the siding on the wall, the fastener must resist withdrawal, and the head must hold the siding firmly. Be sure to follow the specifications in this manual or the manufacturer’s instructions for the fastener diameter, length, and head size, or staple crown size. Use of utility trim: Securing the top edge of vinyl siding where it has been cut to fit under windows or roof lines is critical. Be sure to use utility trim (undersill trim) and to crimp the cut edge of the siding so that it is held tight. Attaching directly to wood sheathing: Sometimes the manufacturer’s instructions allow the siding to be fastened directly to wood sheathing, without penetrating into studs or framing. When using this alternative, be sure to carefully follow the instructions for fastener type, size, spacing, and penetration depth. The same goes for vertical siding, which is almost always installed directly to wood sheathing. Installing over foam sheathing: Installing vinyl siding over foam plastic sheathing introduces special considerations. Foam sheathing transfers more of the wind pressure to the siding than does wood sheathing, and it does not offer any fastener withdrawal resistance. Be sure to follow the instructions for foam sheathing installation that appear in this manual. Vinyl siding, insulated siding, and polypropylene siding are exterior claddings, not water-resistive barriers, and are designed to allow the material underneath to breathe. This factor provides a supplemental rainscreen that reduces the amount of water that reaches an underlying water-resistive barrier. To achieve designed performance, and to comply with the 2015 International Residential Code, vinyl siding, insulated siding, and polypropylene siding must be installed over a water-resistive barrier, which is intended to prevent liquid water that has penetrated behind the exterior covering from further intruding into the exterior wall assembly. Water-resistive barrier systems often consist of: a combination of exterior cladding such as vinyl siding; insulated siding or polypropylene siding; flashed wall openings and penetrations; water-resistive barrier material; and sheathing. Effective exterior wall systems will shed the water initially, control moisture flow by capillary and diffusion action, and minimize absorption into the wall structure. The level of water resistance required is determined by the applicable building code, the structure, and the climate. Note that additional measures may provide increased protection against water intrusion than the minimum requirements of the building code. Store the cartons on a at surface and support the entire length of the cartons. Store the cartons away from areas where falling objects or other construction activity may cause damage. Do not store the cartons in stacks more than six boxes high, and make sure the stacks are stable. Do not store the cartons in any location where temperatures may exceed 130° F/54.4° C (e.g., on blacktop pavement during unusually hot weather or under dark tarps or plastic wraps without air circulation). Safe homes use re-safe claddings, which include vinyl siding. Vinyl siding provides good fire performance because it is composed mainly of polyvinyl chloride, more commonly known as vinyl or PVC. Due to its chlorine base, vinyl siding does not ignite quickly and is inherently ame-retardant. All organic materials (anything containing carbon) will ignite. But the higher the temperature a material has to reach before it flames, the safer it is. PVC will not ignite, even from another flame, until it reaches about 730°F (387°C) and won’t self-ignite until about 850°F (454°C). Those ignition temperatures are significantly higher than common framing lumber, which ignites from a flame at 500°F (260°C) and self-ignites at 770°F (410°C). Exterior cladding is not a factor in most fires, as 96 percent of fires start on the inside of structures. In fact, when fire-resistive construction is required by the building code, vinyl siding is specified as a cladding option in several UL fire-rated assemblies. All building materials should be installed in accordance with local and state building code requirements. Asbestos siding is a regulated material, and the appropriate environmental agency or local building code official should be contacted before re-siding over this product. If a building is in a historic area, local historic district, or has been designated as a historic building, make sure that approval for the use of vinyl siding has been obtained from the local historic society or local Historic District Commission. This applies to building additions as well. Exercise every care to retain architectural details wherever possible. Do not remove, cover, or add details until the building owner’s written approval has been obtained. Determine that the owner has consulted the local historic society for approval. Use siding that closely approximates the appearance of the original siding in color, size, and style. In historic districts, the goal is to match the product as closely as possible and retain the original trim. Dispose of all scrap or excess material in a manner that is consistent with local and state rules and regulations. PVC is a thermoplastic material that can be recycled; for more information, contact the siding distributor or manufacturer about the availability of recycling programs. 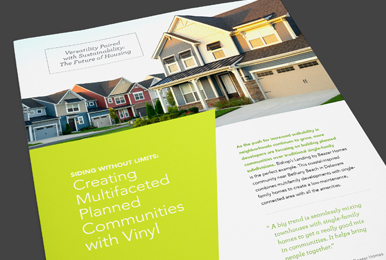 VSI provides a number of resources to promote vinyl siding’s beauty, durability, value, low maintenance, and other product attributes, through its America Sides with Vinyl campaign and the VSI Product Certification Program. Resources such as the Designing Style Guide, an interactive guide to many home designs made possible with vinyl siding, and the Official List of Certified Products and Colors. Installed panels and accessories must move freely from side to side. When installing a siding panel, push up from the bottom until the lock is fully engaged with the piece below it. Without stretching the panel, reach up and fasten it into place. Fasten nails or other fasteners in the center of the nailing slot and make sure the fastener penetrates a total of at least 1 1/4” (32mm) into a nailable material such as wood sheathing and framing. Do not force the panels up or down when fastening in position. Do not drive the head of the fastener tightly against the siding nail hem. Allow approximately 1/32” (0.8mm) (about the thickness of a dime) clearance between the fastener head and the siding panel. Make sure the panels can move freely back and forth. Drive fasteners straight and level to prevent distortion and buckling of the panel. Leave a minimum of 1/4” (6.4mm) clearance at all openings and stops to allow for normal expansion and contraction. When installing in temperatures below 40° F/4.4° C, increase minimum clearance to 3/8” (9.5mm). Do not caulk the panels where they meet the receiver of inside corners, outside corners, or J-trim. Do not caulk the overlap joints. Do not face-nail or staple through siding. Vinyl siding expands and contracts with outside temperature changes. Face-nailing can result in ripples in the siding. In re-siding, furring or removal of uneven original siding may be necessary; take appropriate actions to ensure a smooth and continuous surface. In new construction, avoid the use of green lumber as the underlayment. Keep in mind that siding can only be as straight and stable as what lies under it. The installation of specific products may differ in details from the instructions given in this manual. Always follow the manufacturer’s instructions, using parts specified by the manufacturer, to ensure proper installation. Use an ordinary, long-handled car washing brush. This brush has soft bristles, and the handle fastens onto the end of the hose. It allows the siding to be washed just like a car. Avoid using stiff bristle brushes or abrasive cleaners, which may change the gloss of the cleaned area and cause the siding to look splotchy. If mildew is a problem, use the solution previously mentioned, but add 1 quart (0.95 liter) liquid laundry bleach. * Cleaning materials are listed in alphabetical order. VSI does not endorse proprietary products or processes and makes no warranties for the products referenced herein. Reference to proprietary names is for illustrative purposes only and is not intended to imply that there are not equally effective alternatives. Follow the precautionary labeling instructions on the cleaning agent container. Protect shrubs from direct contact with cleaning agents. 1 Preservation Briefs, Number 8, can be ordered by contacting the Superintendent of Documents at 202/512-1800. Or, the brief can be viewed via the Heritage Preservation website. GPO stock number: 024-005-01026-2.